Last night’s post was very short because of physical exhaustion. Tonight may be a short post because Nancy, Andrea, Heike and I had a very good meal at the hotel we’re staying at and we were all engaged in a very easy going, familiar free flowing conversation that lasted over 2 hours. 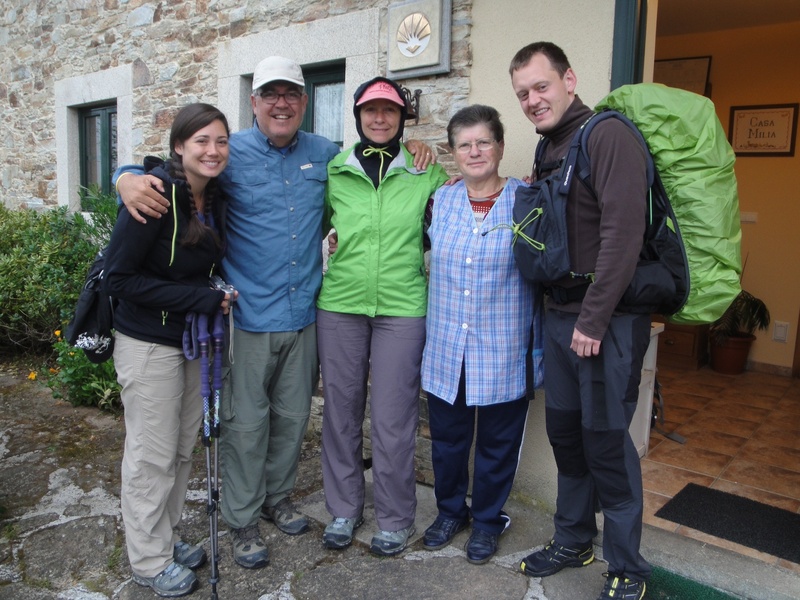 The four of us have a shared experience of walking the Camino together that we will carry the rest of our lives. Heike studied Spanish for two years in preparation of the Camino. Her Spanish speaking is quite good. She’s used it a lot and she believes she has improved in her Spanish speaking. However, although her English was outstanding when we all first met 23 days ago, it has improved even more since she has been speaking to the three of us extensively everyday. Another unforeseen consequence of the Camino. Last night at La Casa Milia we shared a table with a very lovely woman from Madrid, Mila, who works quite a bit in America and speaks excellent English. She offered to give Nancy and I some tips as to what to do and see in Madrid. Also at our table was a very interesting and sweet Norwegian couple who are missionaries in Spain for a very interesting organization sponsored by the Church of Norway. Inge (who spent a year in Minnesota in seminary school) and Soveirene (please forgive me for misspelling your name!) the youngest of 4 sisters (they’re all beautiful if they look like her!) 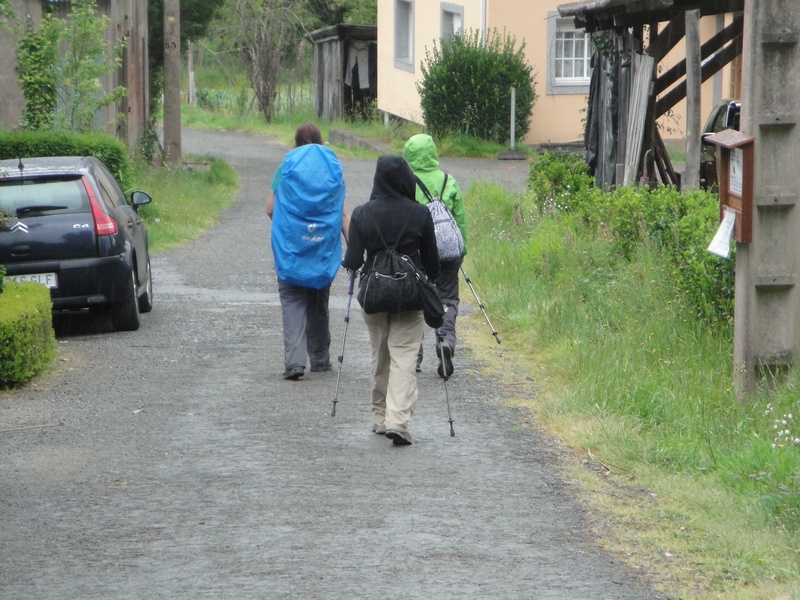 are walking the Camino as part of their ministry in Spain. I hope to see the three of them in Santiago. Maria who I mentioned last night made us a very good breakfast in which the jams for our toasted Spanish bread was home made. It was a good start for our 23rd day on the Camino. The entire day was overcast and threatening to rain. We walked another solid 23 kilometers. That distance is no longer a challenge for any of us. The girls continue to shine. I was tempted to post a picture today of my raw little toe (skin worn right off) but Andrea said, “ooh Dad, that’s gross, don’t post a picture of your toe!” OK, I won’t. Good think we only have one more day to reach Santiago. Otherwise, I would need at least one or two solid rest days to allow my toe to heal. Believe me, I consider myself fortunate that after nearly 500 kilometers of walking from Burgos this is the worst injury I have. The Galician countryside seems to be covered everywhere with river beds and brooks with water streaming down from the high country. That creates a near constant going down a valley then climbing up the valley on the other side of the water. 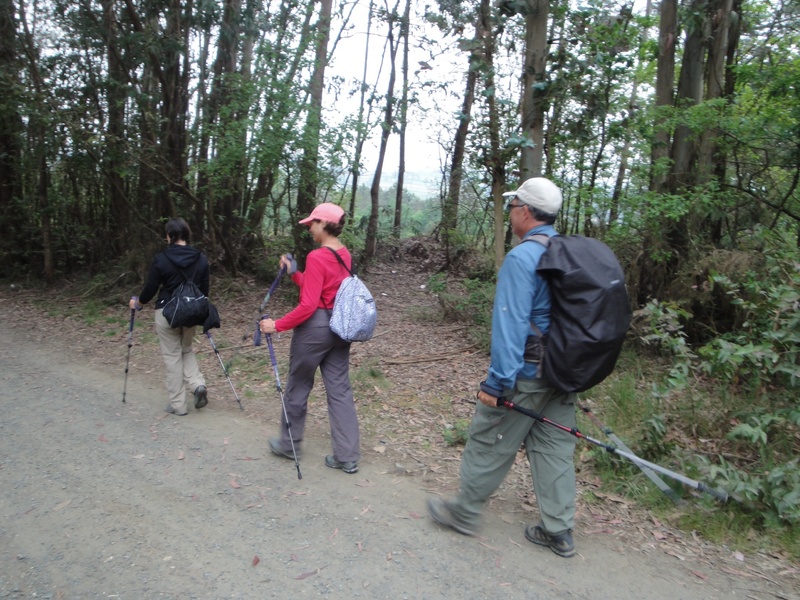 It has not been a level walk for any great distances since we entered the Province of Galicia nearly a week ago. I didn’t see any many familiar faces today on the Camino. That was be design in that we wanted to stagger our last few remaining stages so that we wouldn’t be staying where the majority of the other pilgrims are staying. That’s because we wanted to ensure we had rooms booked in advance. At one of our rest stops today I overheard a phone conversation in which a woman was trying to reserve two rooms this evening. It didn’t sound good. These are four women who started in St. Jean Pied du Port in France. Two are American, one is from Ireland and the fourth from Holland. I hope they found a place this evening. As we get closer to Santiago I’m noticing more makeshift memorials for pilgrims who have died on the Camino. It’s quite moving. 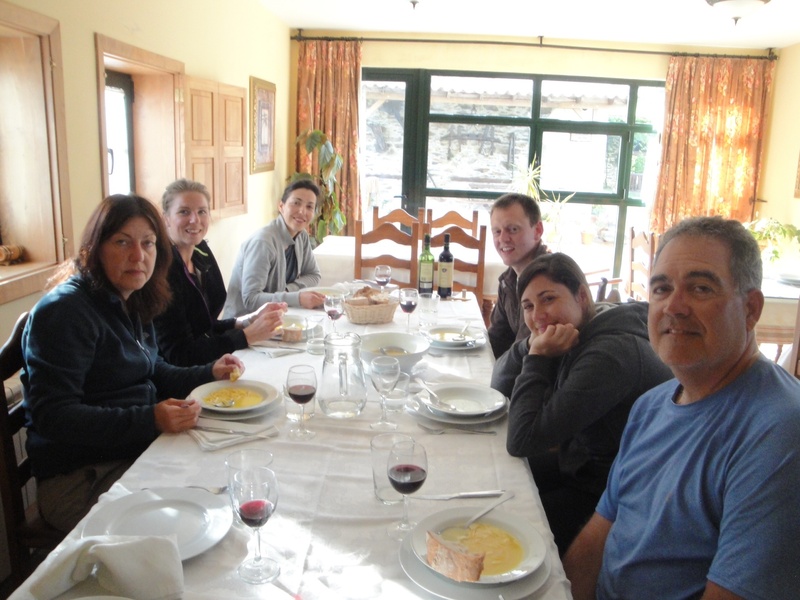 Heike, Solveirene, Mila, Inge, Andrea and I enjoying a home cooked Spanish meal. Can you see how tired Heike and I look? The young Norwegian missionaries on the Camino, Solveirene (sp?) and Inge. 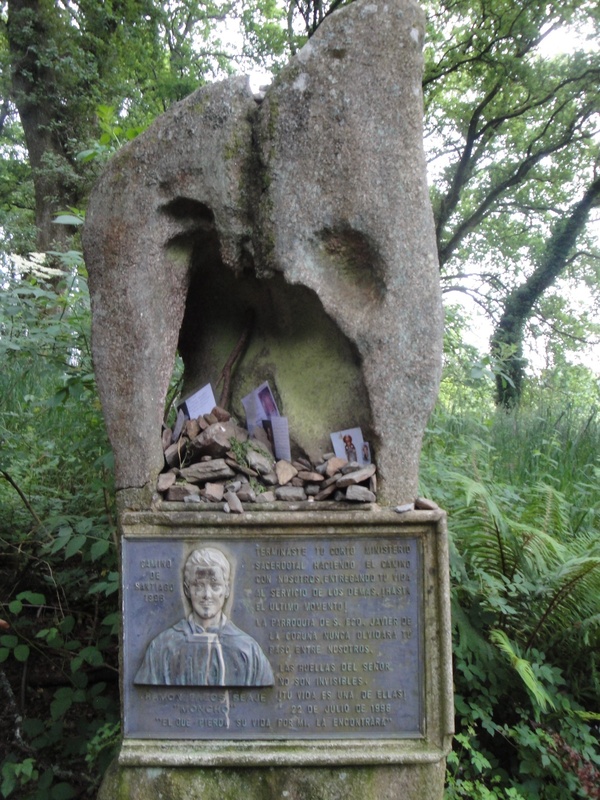 One of many interesting and touching memorials of those who died on the Camino. The Gomez’s getting ever closer to Santiago! 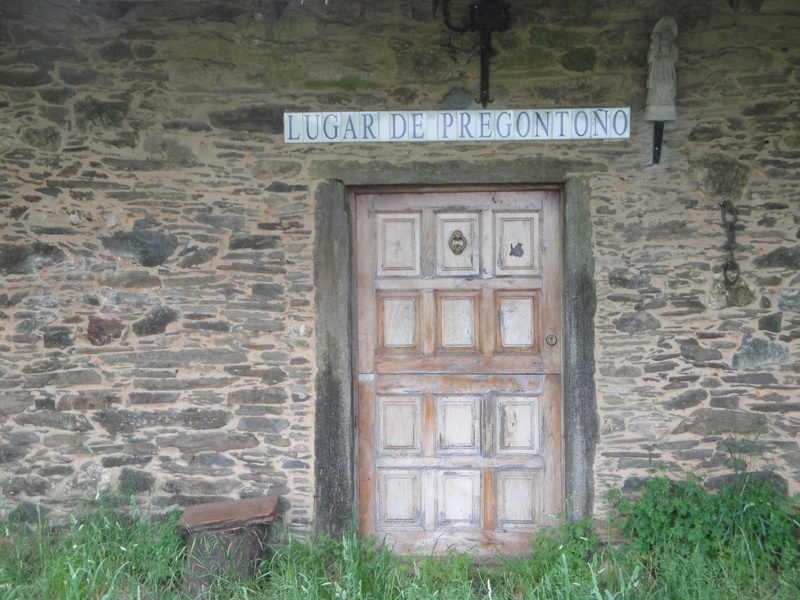 I really like the variety of doors I’ve seen throughout the Camino. 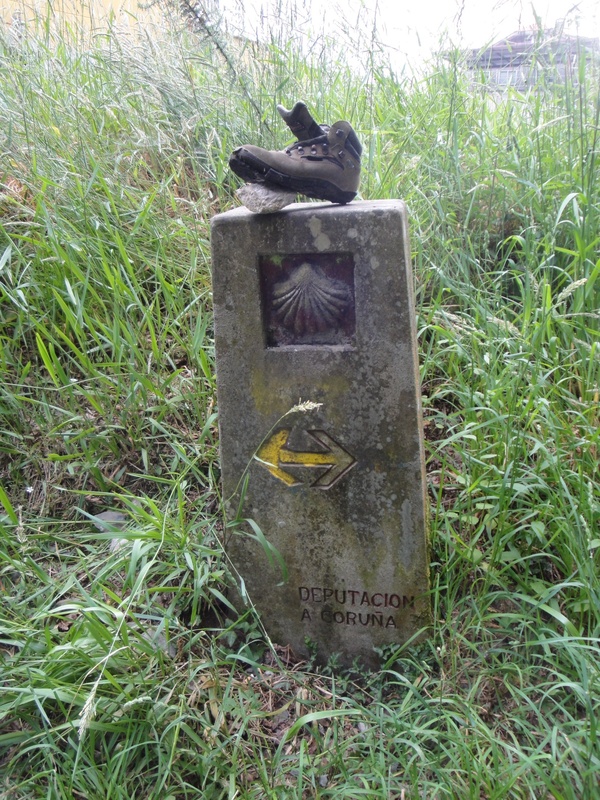 The closer we get to Santiago, the more discarded boots I’m finding on the kilometer markers. 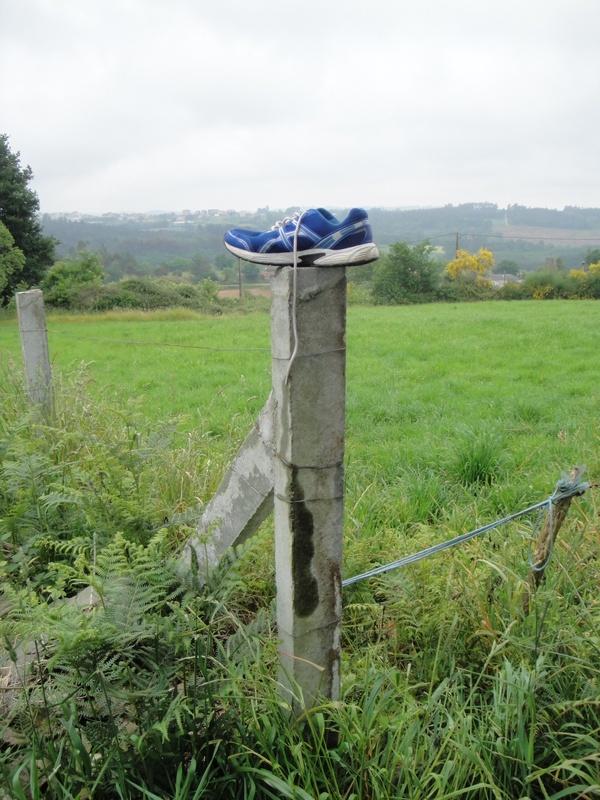 I saw this shoe this morning as we climbed out of the village of Arzua. Then I found the matching pair about an hour later on the Camino! The Camino truly has a sense of humor! The girls walking walking under the dreary overcast skies. 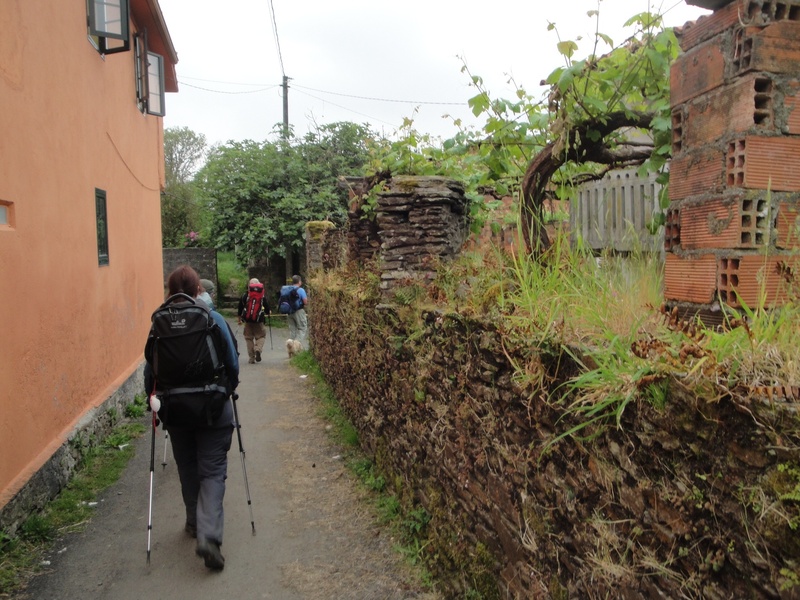 Walking through a typical Galician village. I’m glad to learn that you’ve enjoyed the posts. This has been a wonderful experience to share with Nancy and Andrea. I am inspired! Your spirit is now a part of the spirit of the Camino. To take so many gifts of the road with you and leave and share so many as well. Enjoy Santiago! You’ve Made It!! Thanks for your kind remarks. More to share on my Santiago post. It was really nice to have dinner with all of you at Casa Milia. 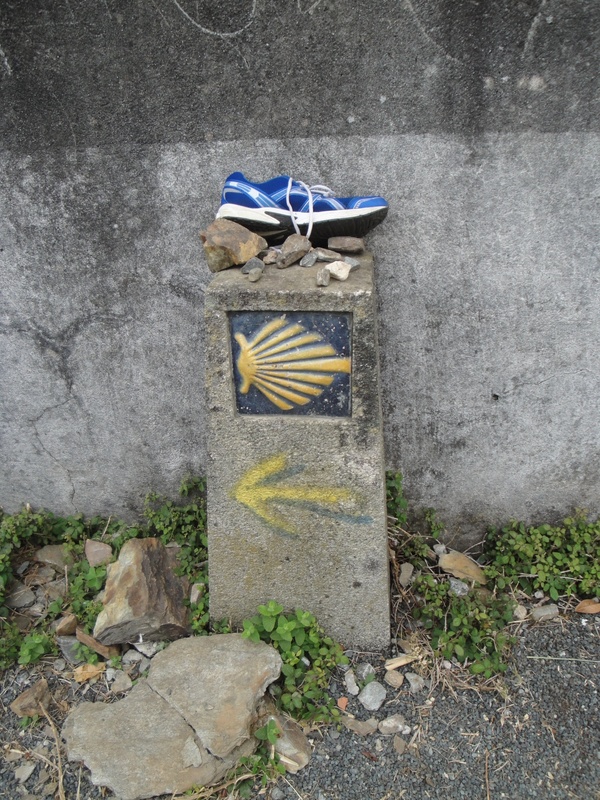 A great Camino moment! I was also very happy to see you in Santiago, wasn’t the arrival special??!!! The Camino continues in life, buen camino! Yes, it was really nice to have dinner with you at the Casa Milia and then seeing you in Santiago. You are so right about the Camino continuing in life. Buen Camino!